Last year, leggy beauty Deepika Padukone stunned everyone with her performance in Sanjay Leela Bhansali’s period drama ‘Padmaavat’. Post that, Deepika took a year-long break as she got married to beau Ranveer Singh. Now, she is all set to enthral the audience once again with her upcoming film ‘Chhapaak’. 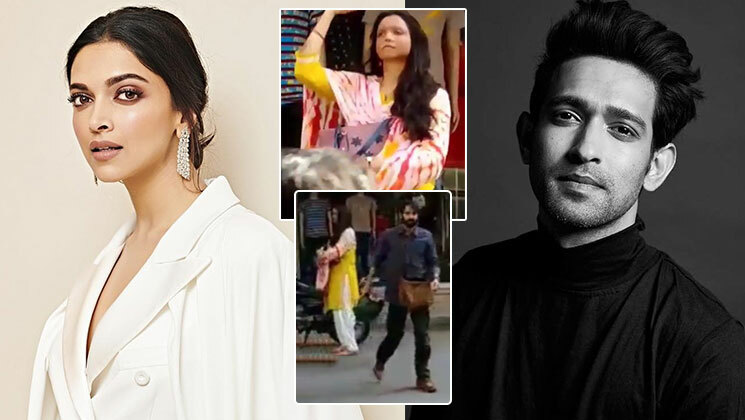 Deepika will be seen alongside Vikrant Massey in this film which is based on the story of acid attack survivor Laxmi Agarwal. The ‘Chhapaak’ team is currently shooting in Delhi and recently, we came across a video of its lead actors shooting on the streets of Delhi. Since Deepika is playing the acid attack survivor, she is sporting some heavy prosthetics for her role. In the on-sets-video that has surfaced on social media, Deepika can be seen riding pillion with Vikrant as they shoot in the busy streets of New Delhi. The ‘Piku‘ actress is almost unrecognisable as Malti (her character’s name in ‘Chhapaak‘). Vikrant is seen sporting a heavy beard look. Helmed by Meghna Gulzar, ‘Chhapaak’ also marks Deepika’s debut as a producer. The film will hit the silver screens on January 10, 2020. Also Read: Say What! Deepika Padukone is a fan of ‘The Marvelous Mrs. Maisel’ – here’s why!